You can specify up to four search criteria, each of which can contain up to four required words. 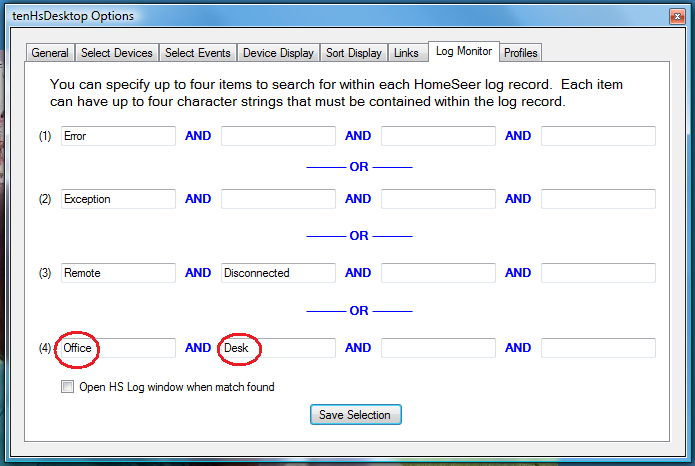 Any record that matches any of the four search criteria will be highlighted in the HomeSeer Log panel. Whenever tenHsDesktop receives an HS log record that matches the criteria, it will flash the HS Log icon until the HomeSeer Log panel is opened. If Open HS Log window when match found is checked, then the HomeSeer Log panel will be opened when a matching record is received.